Lemonade Tycoon Game Review - Download and Play Free Version! Create recipes, advertise, buy new equipment, and make a big profit! Simple objectives and gameplay make this a great tycoon simulation. Exciting upgrades such as, automatic ice makers or giant lemon shaped stands, increase overall business, while providing something to work towards. 10 unique rental locations allow you to gain satisfaction and popularity within different markets. The game's simple nature is limiting-all the actions are predictable and hard to deviate from. Graphics are poor and the game is not visually stimulating. Once beat the game becomes repetitive. 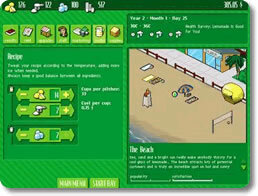 The classic lemonade making tycoon game! In Lemonade Tycoon you start with a small lemonade stand with the goal of making the most money you can. You must tweak your lemonade recipe and price to make your customers happy. When you find the magic recipe, your goal is to upgrade your equipment for faster service and bring as many people as you can to your lemonade stand. Lemonade Tycoon will challenge you to incorporate many aspects of business strategy into your lemonade vending service. Create a high quality product, advertise effectively, give great customer service, and move to the best locations in order to become a true lemonade tycoon! The right recipe is a vital key to success. Try 5-6 lemons, 3 sugar, and 3 ice. When you have too many customers to service (losing sales based on too long of wait time) increase your prices. Once you can upgrade to handle faster sales (lemonade juicer, cash register) buy those upgrades. Marketing isn't important when you already have too many customers to service quickly. Since Lemonade Tycoon is no longer available, try our Roller Coaster Tycoon free download instead. Instead of running a lemonade stand, you can run a theme park! Lemonade Tycoon is a simple game that achieves its goal of being an easy, sit down and play simulation. 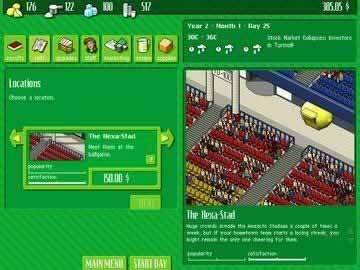 This tycoon allows you to fulfill your childhood dream of opening a successful lemonade stand, while learning that a lemonade business can be more complex than you realize. Become (like the title states) a lemonade tycoon, complete with state-of-the-art stand, appliances, staff, and various rental locations. The game is simple, yet packed with a lot of fun. As you begin the game you are given a small amount of start-up money to buy your first ingredients and get your business rolling. It becomes your job to formulate the lemonade recipe by combining sugar, lemon juice, and ice correctly, while simultaneously scouting out the correct locations to set up shop and make money. As your business and popularity grows, upgrades like ice machines, new stands, and electric signs that attract customers become available and necessary to buy. These upgrades will set you back at the beginning of the game, but the efficiency they bring builds your capital and eventually makes the initial investment worthwhile. Apart from the cool and helpful upgrades, the various rental locations bring a strategic element to the game. These 10 differing locations can be expensive, yet lucrative business ventures. You can set up shop at places like the park, the suburbs, the mall, baseball games, and at a theme park. The more populated locations require more initial money, however, they draw the most people and present the possibility of reaping the greatest rewards. For example, the most you might make in the free of rent suburbs is at most 70 dollars; however, if you spend 150 dollars to rent a stand at the baseball game you can make upwards of 850 dollars. The initial cost is surpassed 10 fold. Also, the game offers clues that cue you in on where to rent. These cues, which might be a dolphin spotting at the beach or a convention downtown, guide you to the most populated and money making rental locations. As far as drawbacks, this game has a few. The most noticeable is the game's simple aesthetics. The audio and visual qualities of the game are lacking. This may initially deter you as a player, however, the game play is not dependent on these factors. A critical flaw of the game is the repetitiveness. Once you've played three hours and beat the game, starting over may feel like more of a chore than a good time. There are only so many lemonade formulas you will want to try and playing the same levels over again will probably get boring. Lemonade Tycoon may become repetitive, which takes away from the re-playability. Although the simple graphics may make you think the game is of poor quality, you will begin to appreciate the game's greatness once you experience the complexity of the business mechanics. Lemonade Tycoon does not try to be something it's not. The game is simple, as simple as selling lemonade on a hot day, which is what makes it great. It doesn't require a lot of time and it is fun to watch your stand grow. This game is for anyone interested in an easy to play and complete simulation game, or for anyone who has or had hopes of making it big as a lemonade entrepreneur.